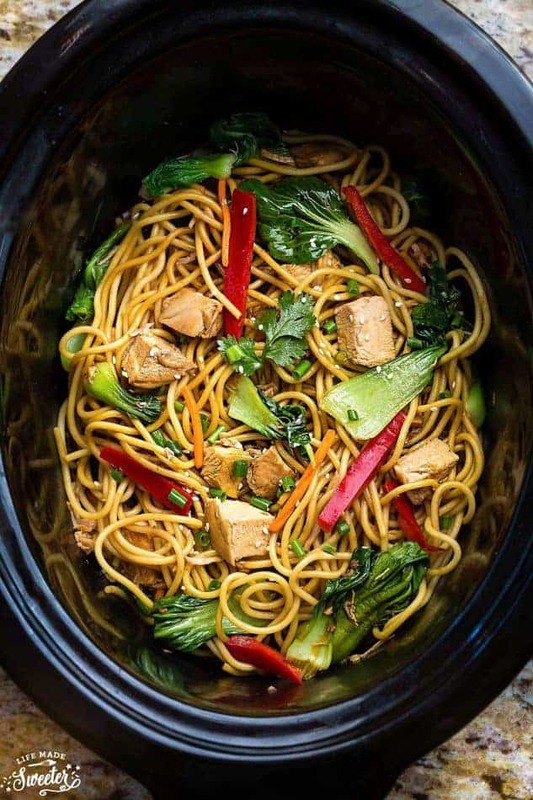 Crock Pot Lo Mein Noodles + Video + Giveaway! 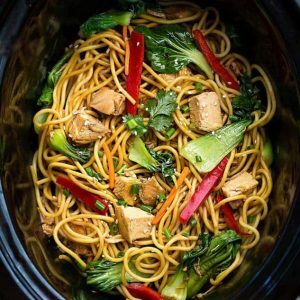 Crock Pot Lo Mein Noodles makes the perfect dinnertime meal that is easy to make right in your slow cooker! Best of all, you can skip the delivery and make this flavorful takeout favorite right at home! It’s amazing how much can happen in just 3 years. How much can change. How people can change. 3 years ago I never would have thought that I would be blogging still…let alone blogging full time and even writing a cookbook. 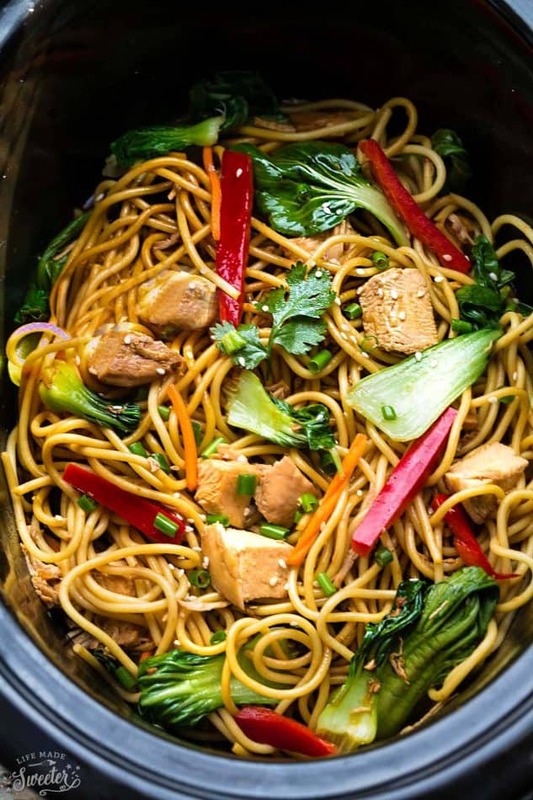 I think this Slow Cooker Chicken Lo Mein I posted 3 years ago is what started it all for me. It got me hooked on using my slow cooker and has remained a reader favorite. I can still remember the day I shared it. Lo mein is something I grew up making regularly but that day, I decided to toss everything into our slow cooker while I took my son out Christmas shopping. When we got home, I threw in some leftover noodles and was surprised with how much my family loved it! Since then, I think I must have made a different variation of it at least 100 times. Sometimes with just veggies and using egg noodles, and then the next time with spaghetti, linguine, ramen and even udon. And to celebrate the launch of my cookbook today, I’m reposting this Lo Mein recipe for any new set of eyes along with a few new photos and a short video. Slow cooker lo mein is perfect for weeknight dinner! Chicken, fresh veggies, noodles, and a tasty sauce make this meal a must try! Once chicken is cooked, transfer to cutting board and cut into cubes or shred with two forks.Toss back in to slow cooker along with bok choy, bell peppers and carrots. To thicken sauce, whisk together corn starch and water in a small bowl and stir into slow cooker. Allow sauce to cook and thicken on high for 30 minutes. Give everything a good stir to combine and coat with sauce. **Use pork instead of chicken or extra firm or deep fried tofu for a meatless meal. I also have a vegetarian version on my site. I feel so extremely blessed to have some of my friends celebrating right along with me so I thought it would be fun to share all of the recipes that they made so you guys can see how talented each of them are. Even if there are some duplicates, it’s always fun seeing how each blogger interpreted or adapted the original and each one of them look SO delicious. Click HERE to see the list and stop by my their blogs and say hello! I’ve teamed up with my friends over at KitchenAid to bring you this giveaway as a way to say THANK YOU for being awesome! You can find me over on their Kitchenthusiast blog on December 22nd sharing 3 Easy Slow Cooker Holiday Side Dishes. They’re helping to bring two lucky readers One KitchenAid Multi-Cooker and One KitchenAid Slow Cooker. I own both and they work like a dream! THANKS FOR YOUR ENTRY, GIVEAWAY HAS NOW ENDED! Thank you so much everyone! This whole cookbook would never have been possible without you guys. Your support means the world to me and I seriously wish I could send all of you guys a prize pack. Good luck to everyone that enters! Disclosure: The multi-cooker and slow cooker have been sponsored by KitchenAid US, the PayPal cash by me and the books provided by Page Street Publishing. I am SO excited about your cookbook, Kelly! You are such an inspiration and I know even more great things are headed your way!These lo mein noodles look SO good! I’ve never made them in the crock pot before, so I need to try this! We love lo mein! Making it in the slow cooker is such a great idea! It looks delicious! Looks SO good! I’ve never made noodles in the crockpot before!! What a great idea! Congrats again on your gorgeous new cookbook, Kelly! I’m so excited to get mine so I can put all of your amazing recipes on my dinner menu! 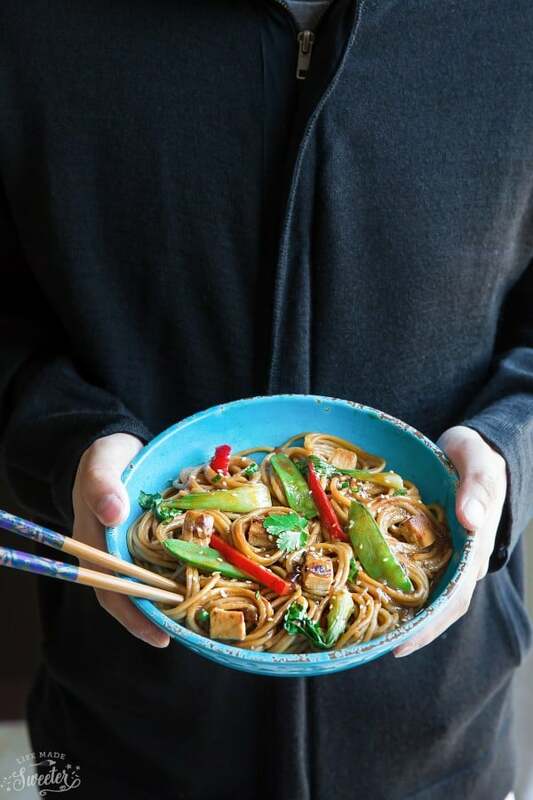 In the meantime, I’m just gonna be over here dreaming about this beautiful lo mein! CRAVING a bowl of noodles now! Kelly – what an exciting day. It’s Election day AND your book launch!! : ) I ordered my copy and according to amazon, it should arrive right on time today! I can’t wait to get it and start cooking from it!! I know it will be amazing. I have a lot of the pantry items I know I’ll need already on hand so I’m ready. : ) Good luck with everything; you totally deserve every success! And love the fun video and the one yesterday with your sweet family. Your mom and dad must be so proud! Way to go!! The noodle dish looks amazingly appetizing and satisfying. HUGE HUGE congrats on your cookbook Kelly! So excited and happy for you!! 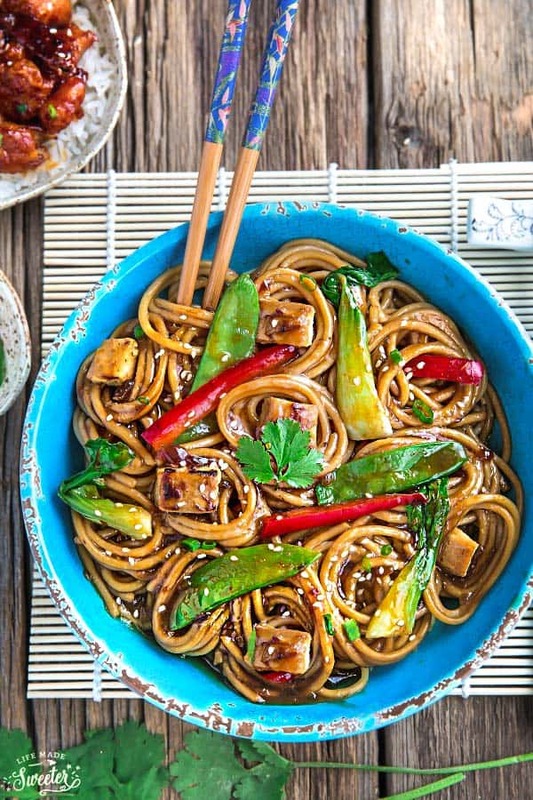 And this lo mein dish … gah you’re making me hungry for lunch already! I’ll take a huge bowl! Much inspired to read your article about the cookbook Kelly! Still you continue your blog, though you did not know how long you continue this path. This is very positive think, hats of your thought. Moreover, you made too yummy dish using of chicken, which is made me hungry. Ah, that is so exciting! I’m so excited for your cookbook!! This also sounds absolutely amazing! I will definitely be needing a huge serving of this sometime this week! Isn’t it amazing how doing something on a whim can change everything? I’m so glad you tossed all that in the slow cooker — that’s what led you to your cookbook (which I should be receiving any time now)! I need to add this to my meal plan and big congrats to you again on that cookbook Kelly! Huge congrats on this exciting day of your cookbook release, Kelly! The photos in your cookbook are simply gorgeous, the recipes are fantastic, and the slow cooker and Asian cuisine tips are so useful. I can’t wait to make, ohhhhhh, pretty much every single recipe! Wow! Love how beautiful and comfy these lo-mein noodles look. I love how beautiful and bright that first photo is. Crockpot noodles is a great idea. Kelly, I am so excited and happy for you!!!! So much work!!! Congrats on the book! I cannot wait to help you promote this and I can’t wait to read it and cook from it! Congrats on the cookbook! I’m so excited for you that it’s finally here! Love the video and am seriously craving some lo mein now! Congratulations on your beautiful new cookbook!! I have a question about the giveaway. I was only able to find the extra points and it only involved Instagram. Did I miss something? I don’t use Instagram. This is the best 🙂 anything that involves a crock pot is a winner in my book. Thanks for sharing this, Kelly–and congrats on all of your successes! Your lo main sounds delicious and it couldn’t be easier. What can I use instead of oyster sauce? You can just leave it out and adjust the salt if you prefer. .